Fintech Prime is an unlicensed Crypto Currency & Forex CFD broker, which opened in October 2017. Fin-TechPrime.com is owned by Morgan Ltd, which is located at: ul. Maragidik 6, Floor 3, Apartment 6, 1505 Oborishte, Sofia, Bulgaria. Their phone number in Bulgaria is: +359 5294 0381. Customer support email address is; support@fin-techprime.com, and for common broker complaints, read this. Fintech Prime gives their investors a trading platform for CFD and Forex trading called TraderSoft. 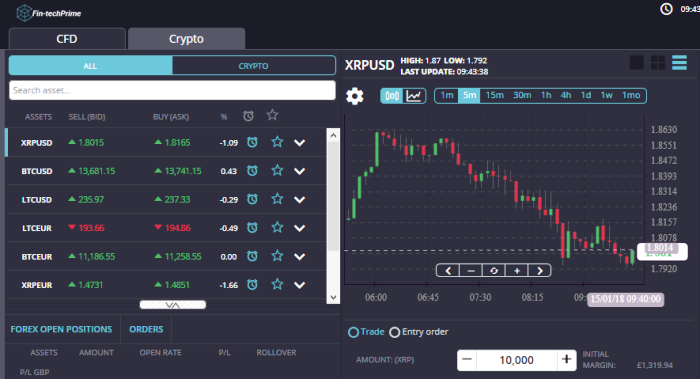 Available for trading are hundreds of underlying assets from Crypto Currencies, Stocks, Commodities and Market Indices. It is interesting to note that no Fiat Forex Pairs were available on their trading platform. The spread on BTC/USD contracts was $60 during our review. This broker only offers their web based desktop trading platform. We did not see mobile apps or MT4 available. Minimum deposit for a new trading account starts at 250 Euro, and offers zero spreads but a 6% commission. When Scam Broker Investigators reviews a new Crypto or CFD trading broker, to determine if they are a legit broker or a scam broker we look for a license. Are they licensed and regulated by a competent government financial regulator like the F.C.A. in United Kingdom. Fintech Prime is not a licensed broker. On November 7th 2018, the FCA warned investors about this company, read more. When choosing a new Forex broker, it is very important to verify that they are in fact licensed for investors from your country of residence. Trading with a licensed broker ensures you will not have issues withdrawing your money, read more. You can pick from hundreds of Forex brokers online, but traders usually choose one of the best brokers, listed here. ForTrade is a popular broker that is licensed and authorised in England by the FCA, look here. Try a Free Demo Account on their custom trading system, register here. What was your experience like investing with Fintech Prime? Please leave your review in the comments below.